What is Inbox Virtual Assistant? What else should I know about this feature? How does Inbox Virtual Assistant work? Why did IVA not read all fields of the bill? Can this feature create multiple bills from a multi-page document? Is there a limit to how many pages a multi-page document can have for this feature? The information will be pre-filled on the review bill screen and the bill will only be created after you review and accept the information. Machine learning gets better over time. During this pilot, if we are not confident with the accuracy of a document, we will not show you any results. Hence, you will see some 1-page documents processed and some that are not. For documents that are not processed by the Inbox Virtual Assistant, they will need to be coded manually. For those documents or fields we are not able to process or copy to the bill, we now have a feature enabling a one-click copy and one-click paste to easily complete the bill's basic details from the document! At this time, this feature is offered on basic invoice information such as vendor name, invoice number, etc. and cannot be used for approvers, notes, and may not be available on all documents. Note: this feature won't be available for screen sizes less than 768px width. Absolutely not! However, we would greatly appreciate any feedback that you might have. Either click on Provide Feedback from the Inbox page and submit it or send an email to iva@hq.bill.com. This will help us focus on the right things to target building next. You will see an informational banner at the top of the Inbox, which will provide you the link to this article and also an email address to opt-out, just in case. Once the documents start coming into the Inbox, any documents that can be processed will be highlighted in blue. There will be some pieces of information highlighted on the document card - like vendor name, due date and amount. 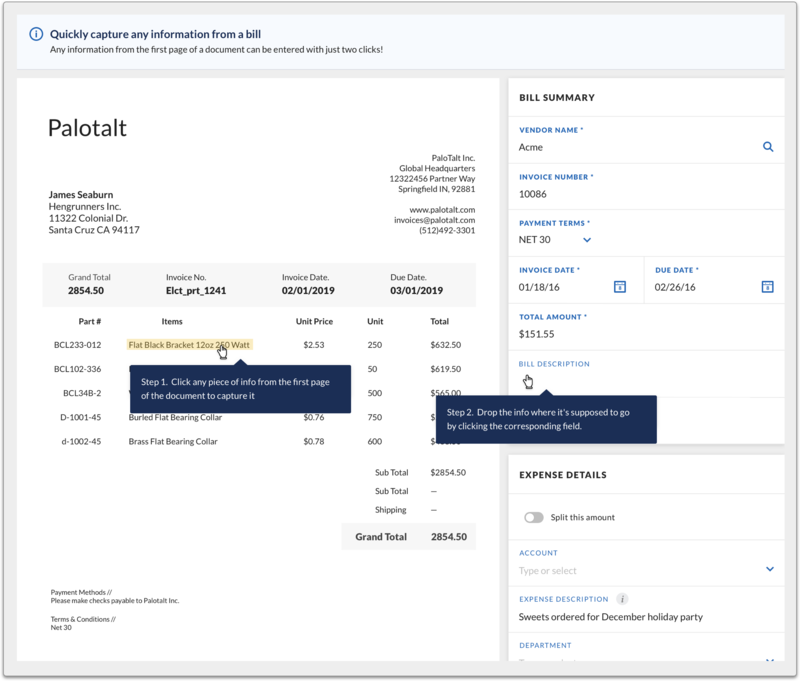 Click Skip without adding a vendor on the bottom right to get to the bill entry screen without adding any information for the vendor. After taking an action in the above screen, you will be taken to the bill entry screen as shown below with the fields populated. Once you review or edit, you can click Save to create the bill. You can verify on the Create Bill page if the IVA predictions are correct by locating the colored boxes. If you correct a field, the colored box is removed. You can also upload or drag/drop a new document onto the Create Bill page. The bill details will be autofilled/ prefilled for review. Fields already touched by the user are excluded from the IVA results. The IVA results will be available within 5-10 seconds of uploading or dragging and dropping a document in. Machine learning algorithms will try to predict all five (5) required fields for creating the bill. If it can only predict less than five (5) with high confidence, we will show you those to give you some help with data entry. IVA does not currently recognize foreign currency, the amount field will be blank for foreign currency bills processed via IVA. No, IVA will not create separate bills from a multi-page document. Yes, IVA will trigger on a multi-page document up to 100 pages. Please send an email to iva@hq.bill.com if you wish to opt out of this beta.